Crafted in 14ct Strawberry Gold, this lustrous ring showcases a contemporary cushion cut Peach Morganite stone surrounded by delectable Chocolate and Vanilla Diamonds. A charming alternative to the standard engagement ring or an unforgettable gift for someone special. Matching Band: 5102316. 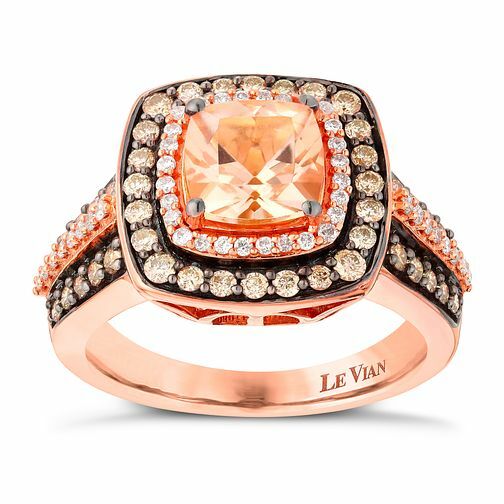 Le Vian 14ct Strawberry Gold Morganite & Diamond Ring is rated 1.0 out of 5 by 1. Rated 1 out of 5 by Anonymous from Not for everyday wear (would not recommend as an engagement ring) Chose as my engagement ring, I wanted a pink diamond & something different, but after just 6 months noticed chips & dents in the gold around the outside diamonds, upon further inspection at my local Ernest Jones store, the main diamond had sunk to one side & claws damaged also! The ring was hardly worn, never been dropped or exposed to any real wear! Platinum cover for repair but I still wasn’t happy - I have now exchanged for a Vera Wang rose gold plus I returned my matching Le Vian wedding band. Excellent customer care at Ernest Jones Argyle Street, Glasgow.